Shall we start with the weather? If weather dot com is to be believed – we will be doing the triple-digit dance starting tomorrow. Ugh. So, our happy little mild spring will be officially a pleasant memory after that. A friend of mine recommended her weather man – he was predicting much cooler temps than mine. I may take her up on that recommendation! 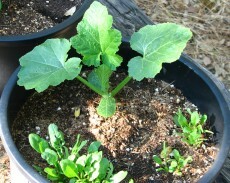 The squash baby has grown! So has it’s companion spinach planting… I’m not sure how well the spinach will do, but it’s nice to see it’s trying it’s best. We also have tomatoes, a pepper plant and cucumbers planted. A couple of pots have flower starts in them. We have no plans to eat flowers, even though at least a couple of the varieties planted are considered edible. I just like the color. As of this Sunday, Smith and The Jones Girl have been hitched for six years. Boy that went by fast.